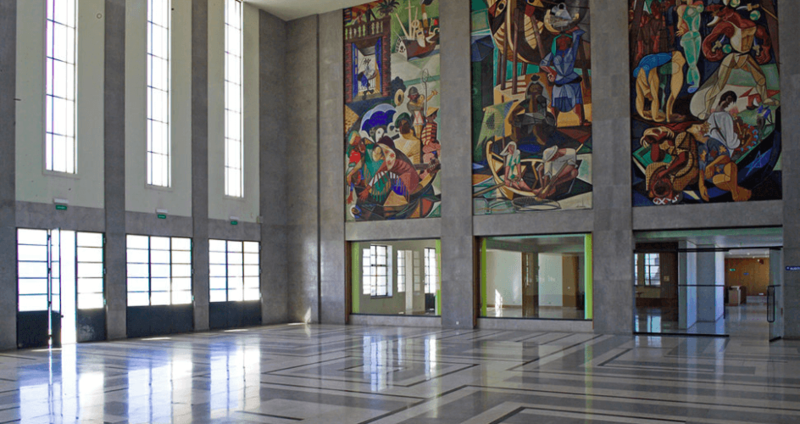 In pursuit of the mission of docomomo, as updated in the Eindhoven-Seoul Statement 2014, the theme of the 14thInternational docomomo Conference will be Adaptive Reuse. The Modern Movement Towards the Future: The aim is to promote the conservation and (re)use of buildings and sites of the Modern Movement, to foster and disseminate the development of appropriate techniques and methods of conservation and (re)use, and to explore and develop new ideas for the future of a sustainable built environment, based on the past experiences of the Modern Movement. The Modern Movement has demonstrated its long term legitimacy, as a concept endowed with an extraordinary longevity. Relating technology, form and social commitment to one another, through an optimistic faith in progress, modern architects sought to attain new heights of functionality and flexibility in use. The challenge for today is how to deal with this modern legacy in relation to the continuously changing context of the current times, including physical, economic and functional changes, as well as fast-moving socio-cultural, political and scientific contextual values. Preserving the architectural heritage of the 20th century requires us to take account both of the opportunity and the duty to reuse buildings which have lost their original function, which are physically and/or technically obsolete, and which no longer meet today’s ever-more demanding standards. Such matters as the demand for material and technology reuse and for spatial and functional transformations, and the updating of regulations concerning fire, seismic stability, user safety, energy efficiency and environmental comfort legislation, are all part of the contemporary agenda. This inevitably highlights the question of the value of the existing built fabric, which can be a strong resource that calls for our attention in terms of social, economic and environmental sustainability. In its pursuit of the task of conserving and rebuilding, docomomo must itself be modern and sustainable in order to continue to fulfil the Modern Movement’s social and collective project, as modernity and sustainability are part of the primary nature of Modern Movement project itself. In our view, the Modern Movement still carries on today and into the future, as an ever-present social, spatial and technological project engaged with the community, constantly engaging with the challenge of creating a better place to live. Contributions are invited to put together under discussion themes such as the interrelationship of modernity and modern heritage, economy and energy saving, the social mission of architecture and the responsibility of architects towards the future. These themes are intended to be discussed both as MoMo concepts, to be analysed chiefly through documentation, and as contemporary modern interventions, to be debated in accordance with the needs and conditions of today. As a multidisciplinary platform, this conference aims to investigate a cross-section of subjects that are raised by the challenge of preserving, renovating and transforming the Modern Movement legacy worldwide, alongside with the complex background of today’s changing times. In the end, the goal is to achieve a pluricultural comparison of standards and practices for intervention on 20th century heritage. May-28 June 2015_Call for sessions [CLOSED]. 31 July 2015_Call for sessions´ notification of acceptance [CLOSED]. 3 August-18 October 2015_Call for papers [CLOSED]. 30 November 2015_Call for papers´ notification of acceptance [CLOSED]. 1 January 2016_Opening date for registration [CLOSED]. 28 February 2016_Full paper submission deadline (1st version) [CLOSED]. Registration deadline for speakers and session chairs [CLOSED]. 27 March 2016_Deadline for session chairs return papers with comments to speakers [CLOSED]. 17 April 2016_Full paper submission deadline (final version) [CLOSED]. The local organizing committee is working in close cooperation with the following committees, constituted by experts from national docomomo Working Parties and from the Portuguese universities and partner institutions. Picture: Alberto Pessoa, Pedro Cid, Ruy Athouguia, Calouste Gulbenkian Foundation, Lisbon, Portugal, 1969. Gardens by Viana Barreto e Ribeiro Telles. © AFCG, Mário de Oliveira, 1969.